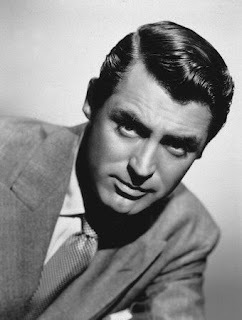 Last week I discussed with Amanda my love for Cary Grant, Grace Kelly, and old movies in general. She suggested creating a "tribute cupcake" to be enjoyed during Cary Grant Sundays and, while I thought it sounded like a fantastic idea, I'm having trouble coming up with appropriate ingredients. What would be a fitting homage to a man so super dreamy that my mom and I both swoon over him? I need your help people! If you're reading this blog, even if you're not following me, do some research or just throw out a suggestion. If you're going to take this literally and suggest including his perfect hair or something like that, please also add in something I might be able to incorporate into a finished product. I'm open to trying out several different iterations, I do enjoy a challenge, so keep the ideas coming. If you can't come up with an ingredient, let me know what your favorite Cary Grant movie is, sometimes inspiration comes from the strangest places. If you haven't seen a Cary Grant movie get thee to the nearest video store (or put your TV on TCM or AMC) and watch! red velvet - because he'd has the best movie kisses?